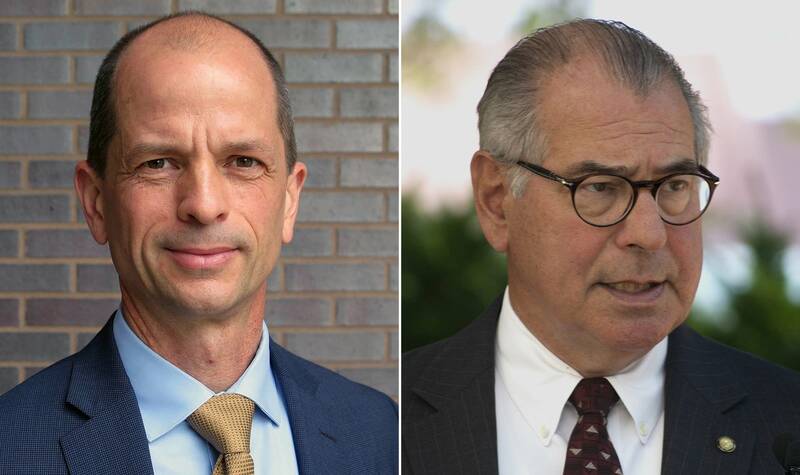 Hennepin County Attorney Mike Freeman and his challenger, Mark Haase, squared off Tuesday night during a Minneapolis forum. Freeman has served as Hennepin County attorney for nearly 20 years, first in the 1990s and now for the past 12 years. "Two years ago, I discontinued the use of grand juries in officer-involved shooting cases to make it more transparent and more accountable. I've redesigned drug charges and sentences. We've tried to reduce criminal impacts to lower level offenders," Freeman told the enthusiastic crowd in the North High School auditorium. Freeman also promised to make other reforms to address the disproportionately high numbers of people of color in the criminal justice system and more specifically, in the Hennepin County Jail. However, his challenger said the inequities in the system continued under Freeman's watch. "When my opponent talks about being a reformer now, I hope you really question that based on his record," said Haase. "I like to hope that if he wins, he's going to make these reforms he's talking about. I don't have a lot of confidence in that based on his record." Haase is the co-founder of the Second Chance Coalition, a nonprofit organization which advocates for people trying to get their lives together after a criminal record. He said too many people get locked up pretrial because they can't afford bail. And Haase said he supports getting rid of the cash bail system. Freeman said bail should be reserved only for people who pose a public safety risk or who are not likely to show up for court. He said that changes are already underway with programs like the city of Minneapolis' sign and release program. That program allows people facing nonviolent misdemeanor offenses to avoid jail for missing a court date. "I think we've made some progress on the bail issue and I'm in favor of moving forward on that reform," said Freeman. Haase responded that there are people currently being held in the county jail who can't afford a few hundred dollars to pay a private bail bondsman. As Freeman made his closing statement, he was briefly interrupted by a man in the audience yelling the name Jamar Clark. Clark, an African-American man, was shot and killed by a white Minneapolis police officer in 2015, sparking weeks of protests. Freeman's decision to not file charges against the officer is still a sore spot for some in the community. Haase got the DFL endorsement for the nonpartisan race. But without any polling, it's not clear who the front-runner is in the race to serve the next four years as Hennepin County attorney.